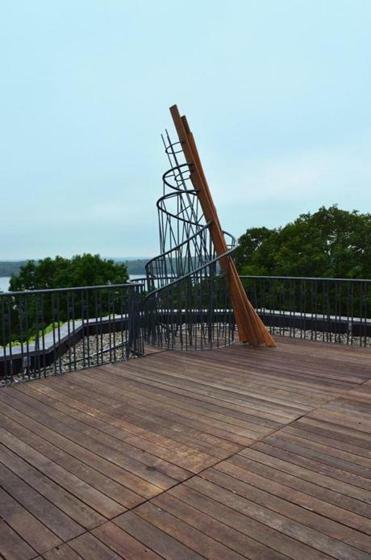 Aaron Stephan’s “Monument on a Museum” echoes the deck’s railings. LINCOLN — Aaron Stephan’s show at the deCordova Sculpture Park and Museum sounds as if it might be dense and heady, a lofty critique of hallmark ideologies in the history of sculpture. No worries. “PLATFORM 12: Aaron Stephan: Secondhand Utopias,” which comprises three site-specific sculptural installations, impudently deflates those high ideals. Even if you don’t know all the back stories, chances are you’ll have a good time. The PLATFORM series offers artists the opportunity to respond to the deCordova’s space — its architectural aesthetic, its landscape, its place in the community. Stephan reprises some of the museum’s workaday details to create his sculptures — the Benjamin Moore color used on the walls, the iron railings and wood planks of the roof deck, and even the lean, clean boxy forms of the museum’s trash cans. These solidly anchor Stephan’s fanciful quotations of some of the epic sculptural designs of the 20th century in the everyday reality of the museum. Chronologically, the show begins on the roof deck, with Stephan’s version of the ambitious pipe dream “Monument to the Third International,” a never-built Russian Constructivist-style tower designed by Vladimir Tatlin after the 1917 Bolshevik Revolution. Tatlin saw it as a model of Communist strength and vision, intended to house legislative assemblies, executive offices, and information services. This early design for kinetic architecture featured rotating glass rooms inside a metal twin helix. It would have been taller than the Eiffel Tower, then an icon of modernity, and copied its girder style. But unlike the symmetrical Parisian landmark, this tower appears to lean, a metaphor for the dynamic thrust of Communism. But the proposal was pricey, and Communist Party officials ultimately soured on Constructivism. Stephan’s “Monument on a Museum,” built from the same humble railings that surround it on the roof deck, is cheekily framed by the deCordova’s turrets on either side. There are no spinning glass chambers within, although a lanky teenager wended his way inside the 16-foot-tall structure when I was there. Stephan has added wooden planks (like those underfoot) that appear to slide up the tower from the roof deck. It’s as if the deck and railing have conspired to make a grand, leaping escape toward Flint’s Pond. Down on the Sculpture Park Terrace, Stephan riffs on Donald Judd’s pioneering minimalist installations of multiple boxes with “Untitled (16 Garbage Cans).” Judd’s idea, hatched in the 1960s — that art could be machine-made of humble materials, with straightforward forms, none leaving evidence of the artist’s hand — was a striking swing away from Abstract Expressionism. ”Untitled (16 Garbage cans)” made with park trash receptacles. Judd had many of his objects manufactured for him. Stephan, with a focus on the nuts and bolts of studio practice that aligns with his fascination with the mundane details of the museum, made his by hand. His aluminum garbage cans are like soldiers in formation, calling as much attention to their use of the open space of the terrace as to their own spare, sleek design. They’re sealed shut, so not functional, but an actual trash can stands like a sentry nearby. Earlier this summer, a museum visitor moved it into formation with Stephan’s installation. That invitation to interact marks Stephan’s work. Even though each piece ponders a great movement in art history, even though museums can be forbidding about touching the art, people step up and play. Stephan’s third piece, a commentary on Robert Smithson’s legendary land-art performances in the late 1960s, tumbles down a hill near the Sculpture Park Terrace. Smithson’s “Asphalt Rundown” featured a dump truck spilling a load of black asphalt down a quarry wall, and his “Glue Pour” involved letting orange glue loose from a bucket down a hill of dirt. Both were monumental plays on Jackson Pollock’s action painting, with Smithson making his mark right into the already industrially altered landscape. 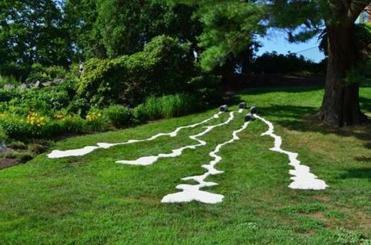 Stephan’s “Spilled Paint” pays homeage to Robert Smithson’s legendary land-art performances. Stephan’s piece is titled “Spilled Paint,” with white rivulets of pigmented rubber (the color of the museum’s interior walls) running from buckets down the hill, playfully shrinking Smithson’s monumental pours down to the realm of spilled milk. A crew of preschoolers scrambled over the piece while I was there, squealing and picking up the rubbery runs of white, doing no harm. They don’t know Smithson, of course. If you do know him, you’ll have a chuckle. Stephan’s clever installations succeed on both levels, and that might be good enough. But it’s the scrumptious layer in the middle that makes his installations so satisfying: The material tethers to the deCordova itself. The art appears to have sprung directly from the museum, discretely from those parts we rarely even notice because our eyes are so busy with the paintings and sculptures. It hints that the building itself has a secret, animate life. 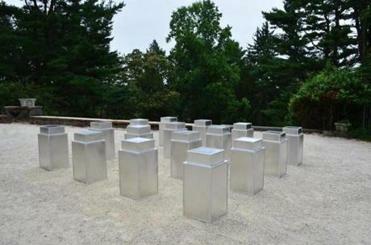 Imagine a “Night at the deCordova” in which not just the goofy Tony Feher sculptures come to life and the giant steel cylinders in DeWitt Godfrey’s “Lincoln” take off rolling down the sculpture park’s hill, but the walls and the floors themselves have something to say. Eerie. Delightful.